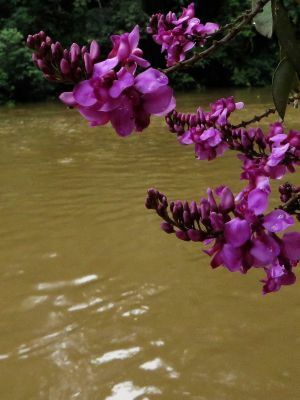 Slow-flowing rivers and the lakes in the upper-watersheds provide sediment-poor "black-water" ecology favorable for certain aquatic life-forms while sediment-rich "coffee and milk" colored waters abound in the Amazon. The reserve is situated precisely on the Equator, where seasonal fluctuations are relatively mild and where rain even falls during the "dry season", allowing species to survive that don't support several months of total drought. 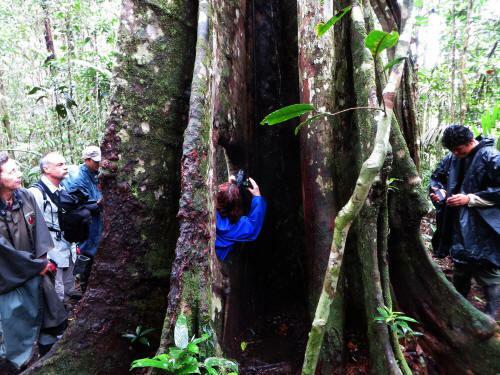 Of the 2 Ecuadorian mega parks, the Cuyabeno Nature Reserve certainly is the most accessible one and with lots of low, epiphyte clad trees, you will be able to see many more Amazon forest plants in Cuyabeno than in Yasuní. 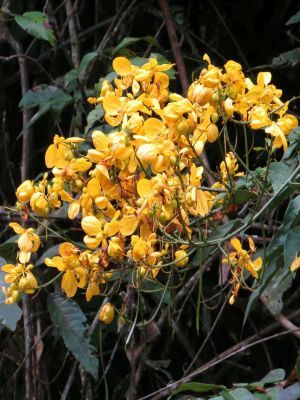 Being extremely rich in plants and trees, it is very rare that a single plant dominates the landscape,and hardly ever a single species of tree or plant can become overly abundant and dominate the vegetation. As a result, flowers show up, one jewel at the time. 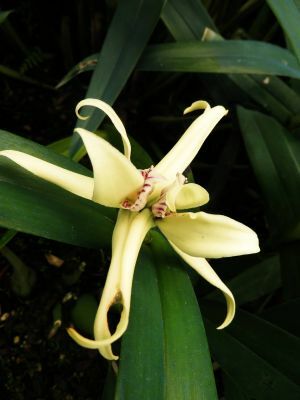 We collected some photographs of tropical flowers and mushrooms from our database for you to enjoy. We hope you will soon join the few privileged travelers that get to explore the Amazon and enjoy the wonders of the jungle from our Amazonas rainforest lodge at the Cuyabeno Lake. 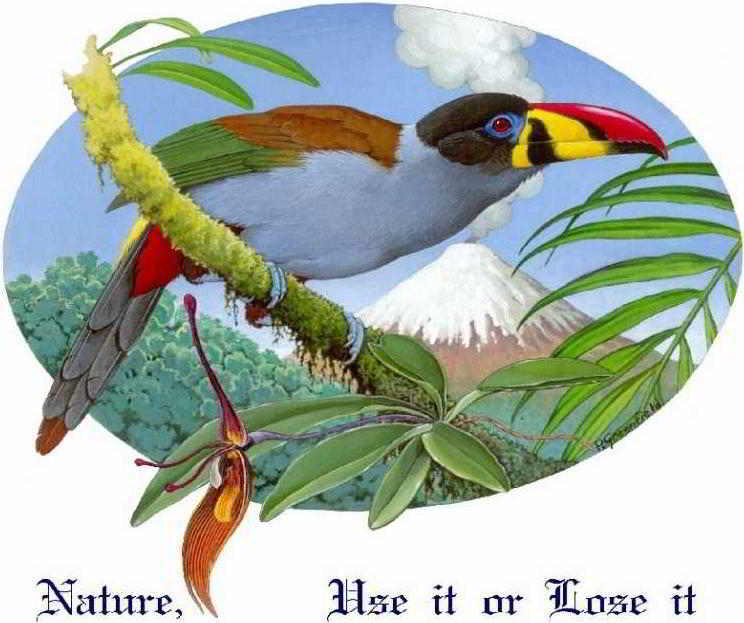 The sunlight on the forest floor of the Amazon rainforest is so low, that few plant species can live there. 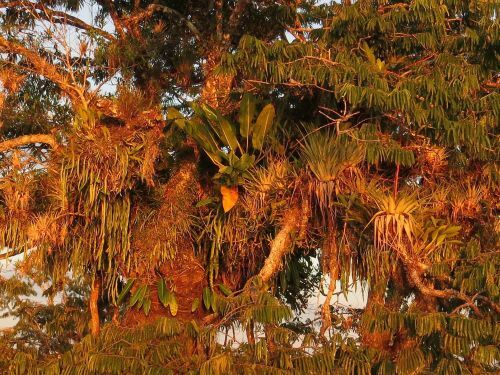 This has resulted in the evolution of plants that may live high up on trees: Epiphytes. 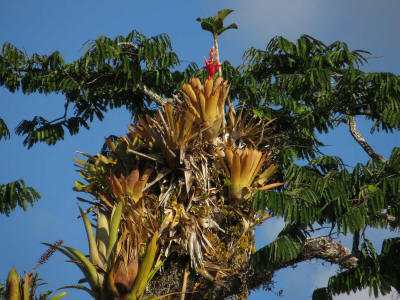 They can grow on trunks, branches, leaves as well as on top of other Epiphytes. 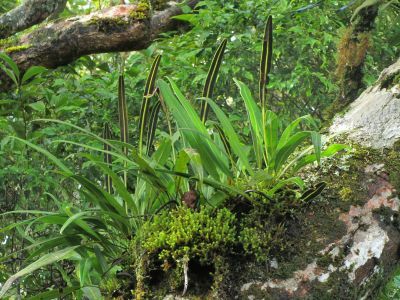 Each tree is an ecosystem by itself with numerous different plant species growing in it, such as Bromeliads, Orchids, Cacti, Aroids, mosses, ferns and lichens. 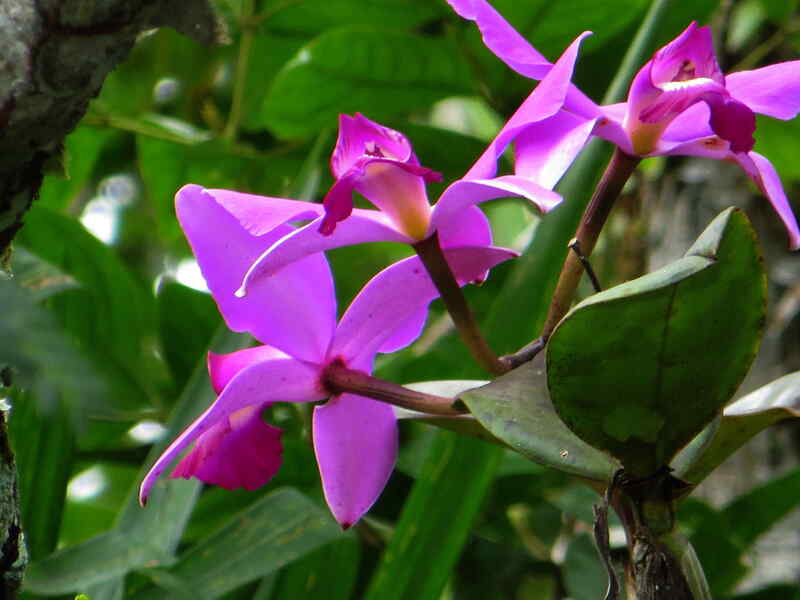 The guides of our rainforest lodge, the Cuyabeno Lodge, are widely known for their knowledge about birds and other Amazon Jungle Animals as well as Amazon Rainforest Plants. 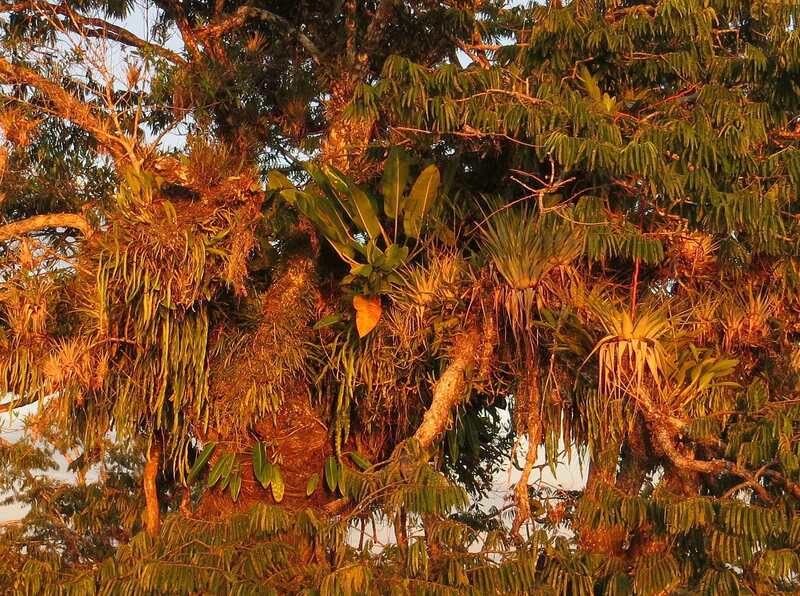 Epiphytes form complete micro-ecosystems in the trees. 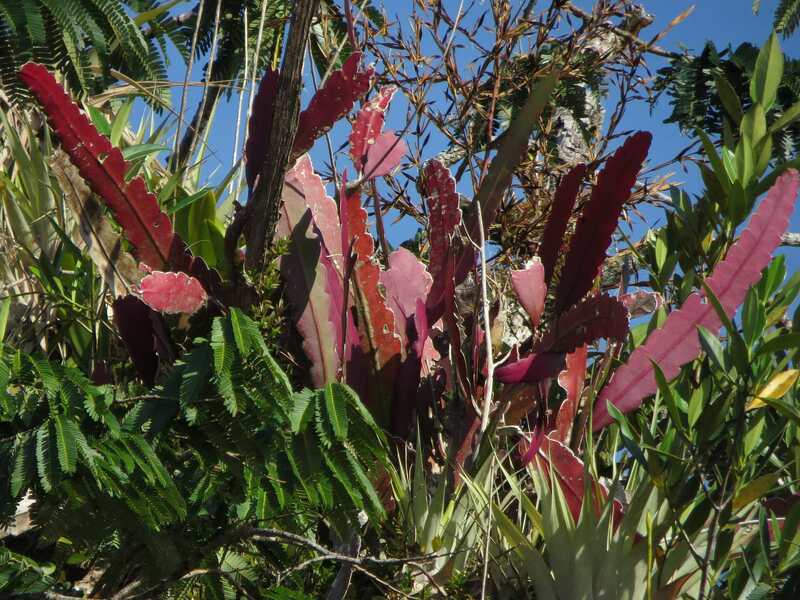 With in excess of 2,000 species of Bromeliads, they're are very prominently present in Cuyabeno. 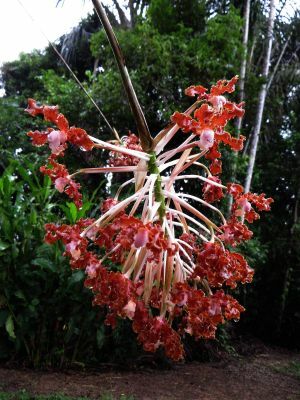 Sometimes, one can find them growing on the ground, but mostly, they live on branches as Epiphytes. The leaves of Bromeliads wrap around their stems thus creating little spaces where rainwater can accumulate. 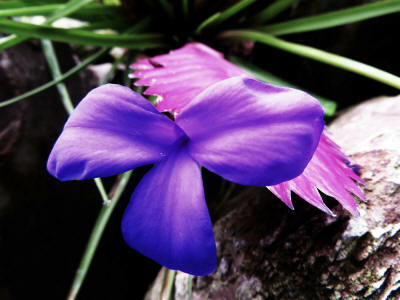 Sometimes a single plant can hold several liters of water. 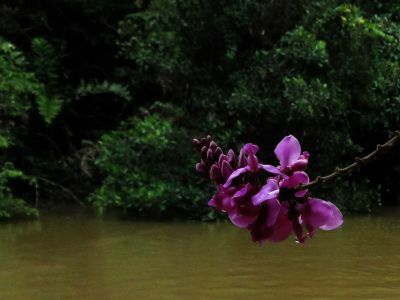 In absence o fishes, these tiny little pools provide safe environments for aquatic species such as amphibians: frogs along with their tadpoles, salamanders as well as their larvae. Other creatures include snails, beetles, mosquito larvae, etc. 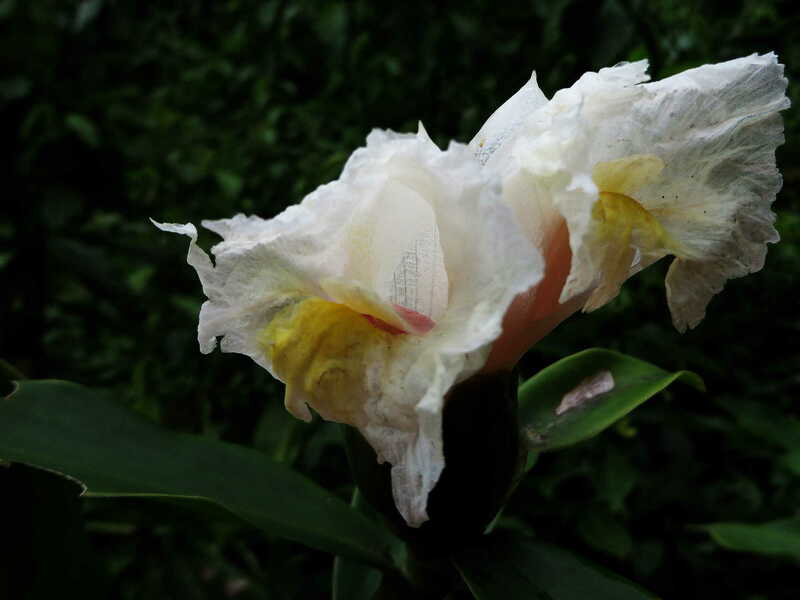 When those animals die, their bodies decay and function as fertilizers to the host plants. 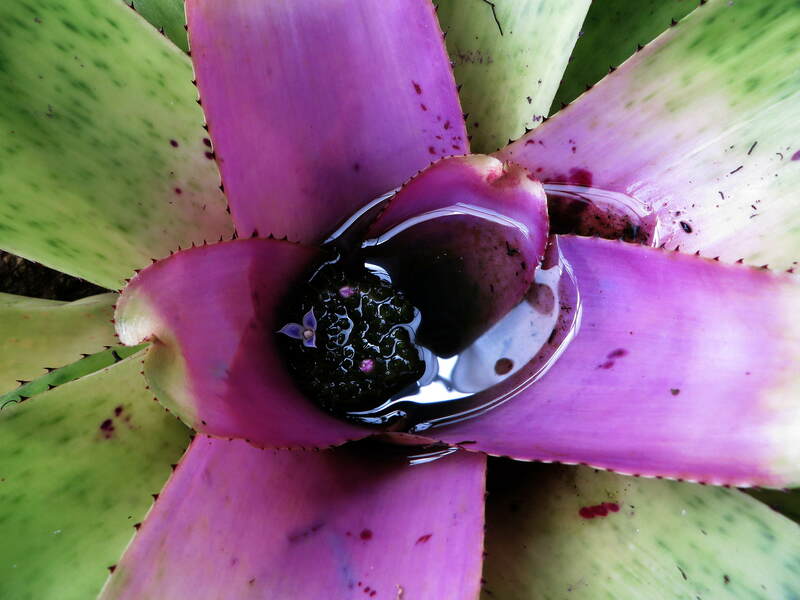 As Bromeliads come in a number of colors like purple, blue, orange and red, they're getting increasingly fashionable as ornamentals. 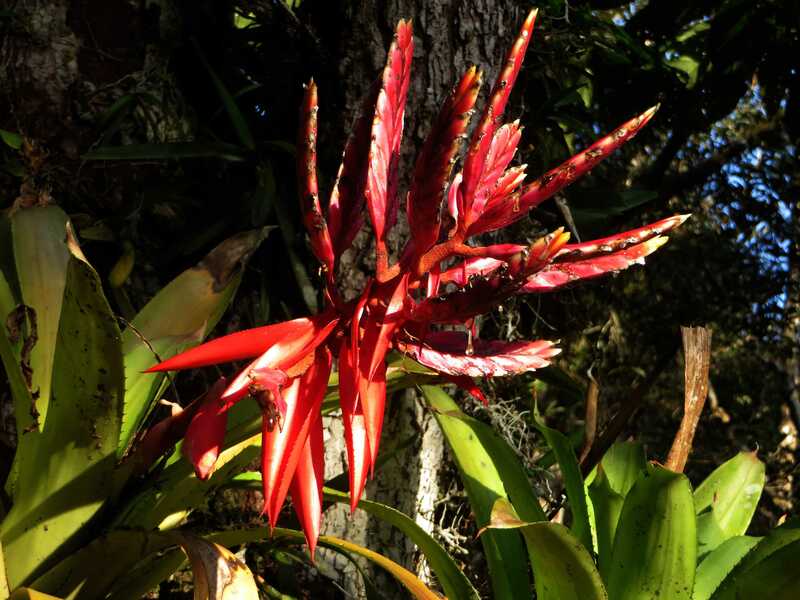 Naturally you know our favorite Bromeliad, the Pine Apple. 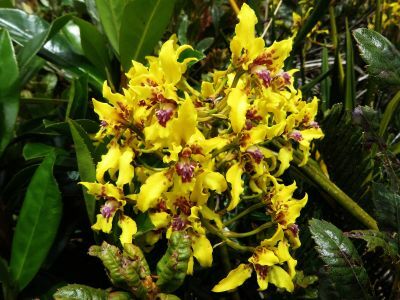 No other group of flowering plants is as numerous as the Orchids. Their number in the Amazon jungle alone exceeds 20,000 species, where they primarily grow on trees as Epiphytes. 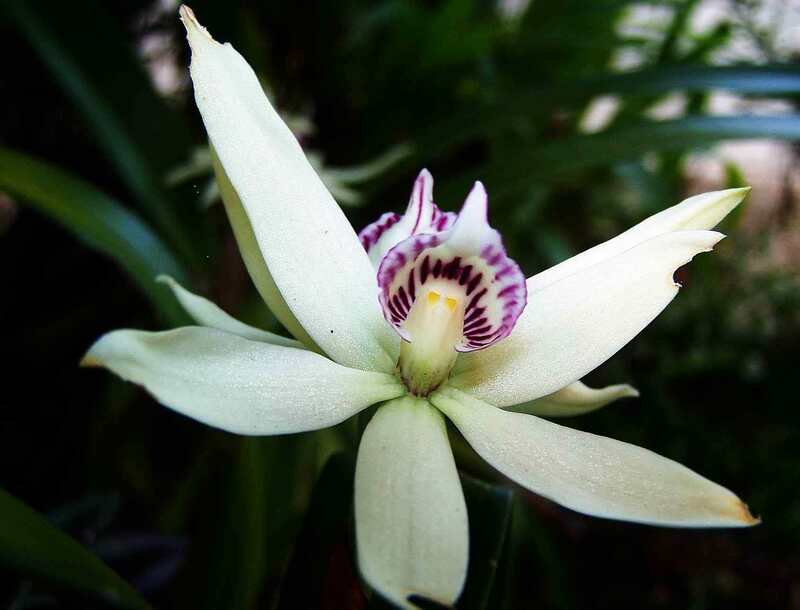 Orchid species come in many different shapes and colors, including green. 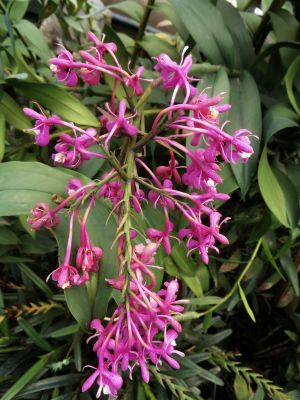 They have grown to be increasingly successful plants to the horticultural sector as clients value the longer lives of the flowers, their bright colors and their exotic shapes. 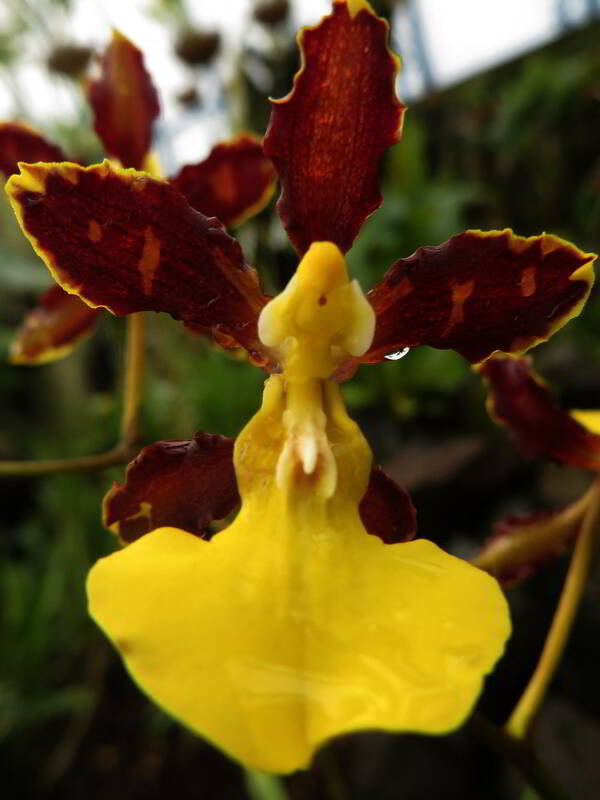 The colors and shapes of orchids never stop to fascinate us. 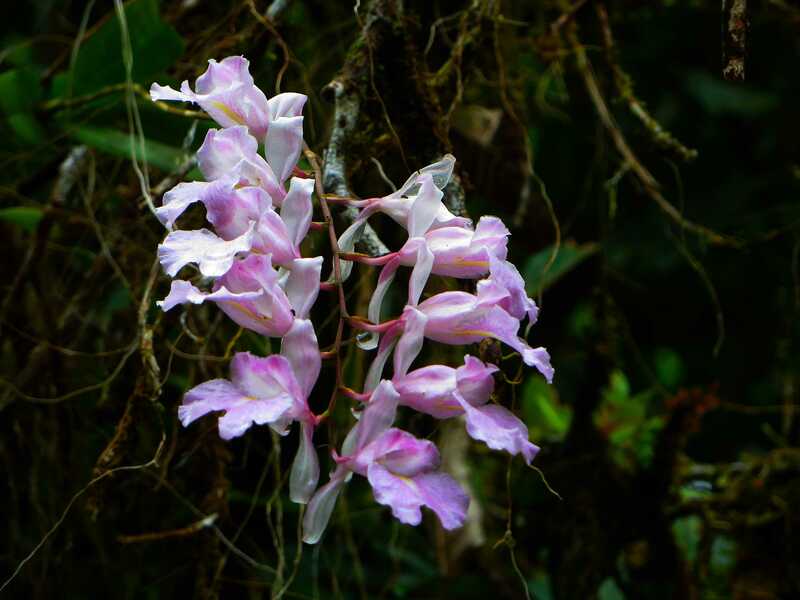 Vines too, constitute a life form that has responded to the low light conditions of the forest floor. 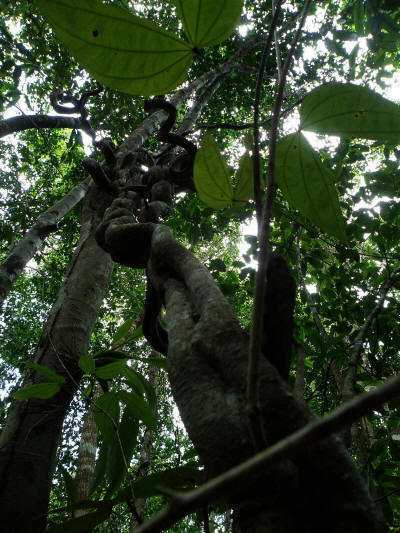 In stead of growing at a rather slow pace like epiphytes, vines grow along tree trunks; without the need to grow solid strong stems or trunks, they can grow much faster to reach the greater light conditions in the canopies. 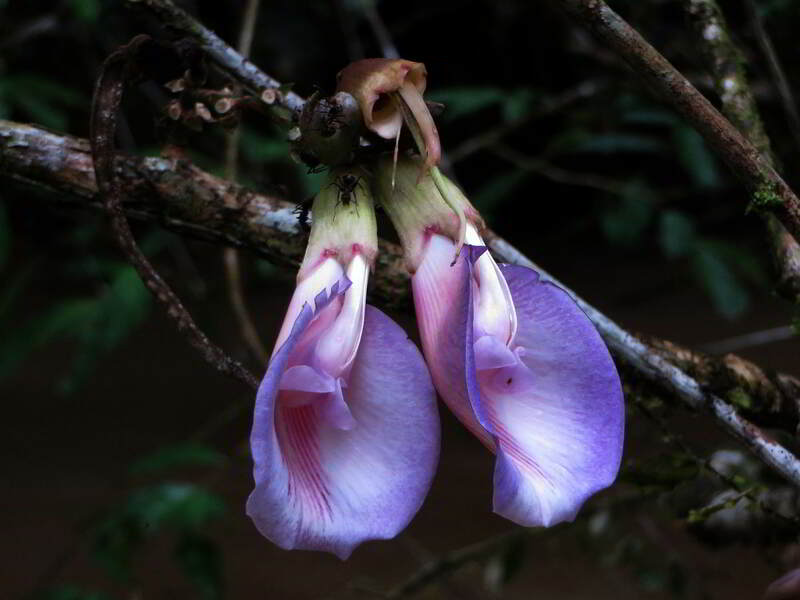 They hold on to tree trunks with sucker roots, tendrils or by winding themselves along their host tree. 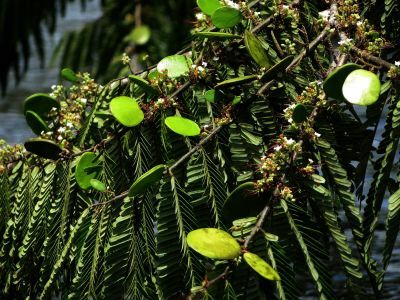 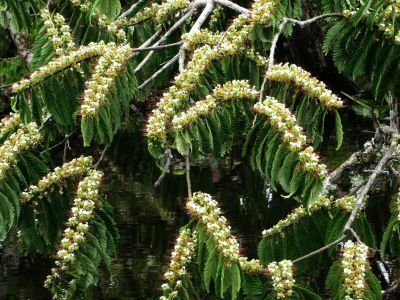 The word "lianas" refers to thick woody vines of the tropics and a number of them may grow to a length of several hundreds of meters as they spread across many tree crowns. 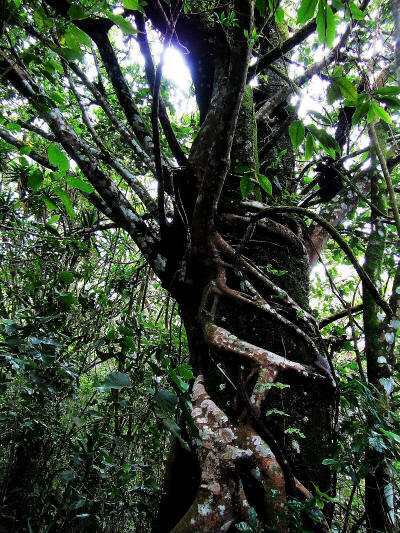 Strangler vines are specialized vines that transform into trees. 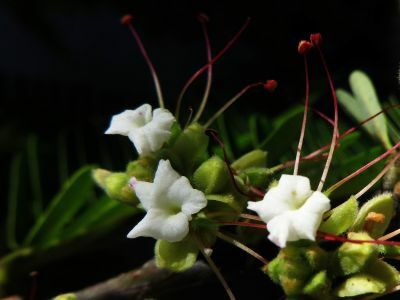 The name refers to a large number of species of vines that grow around the trunk of their host species, which in Hindu are referred to as "Banyan", a name that has spread widely in the United Kingdom. As they grow, they end up suppressing or "strangling their host by depriving it of food and light. After the latter dies, its trunk decomposes and the strangler vine becomes a tree with a hollow core. 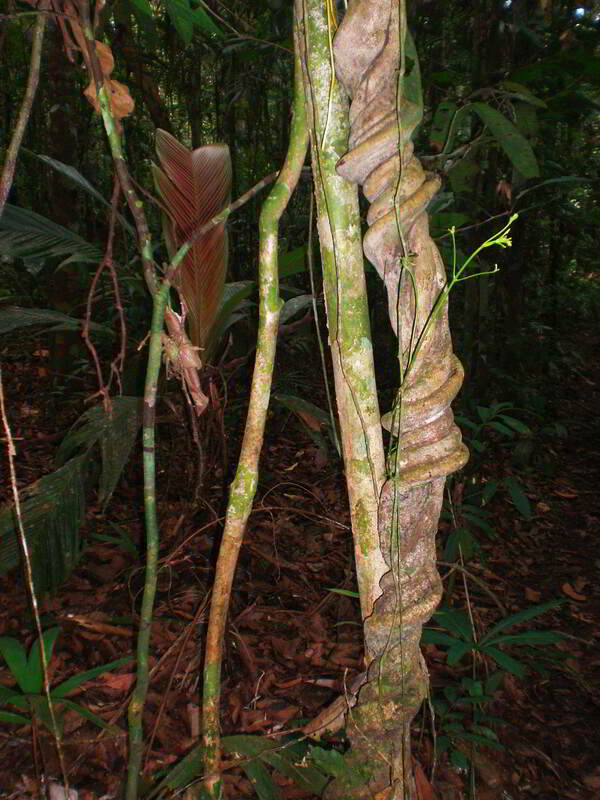 Examples of tropical vines or lianas as they are often referred to in the tropical rainforest. 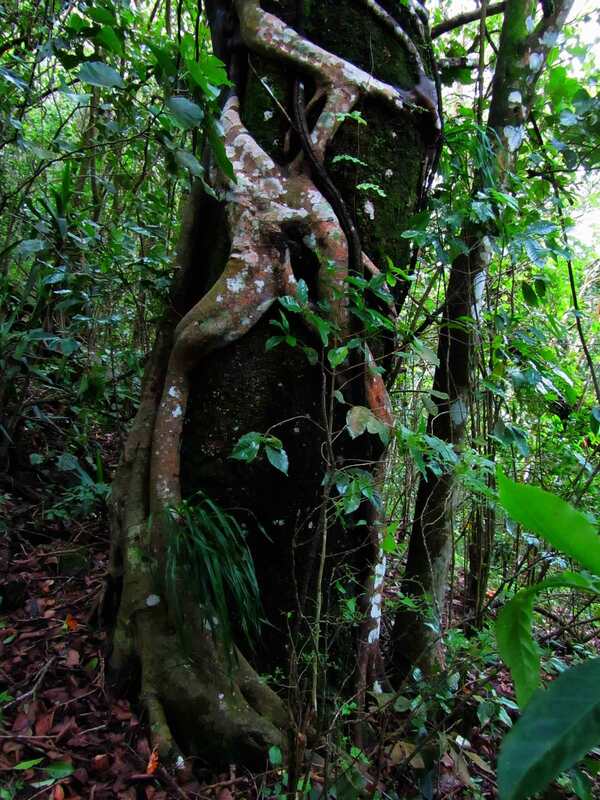 In the picture on the right you can clearly see that very few plants grow on the dark rainforest floor itself. Different stages of strangler vines or "Banyan". 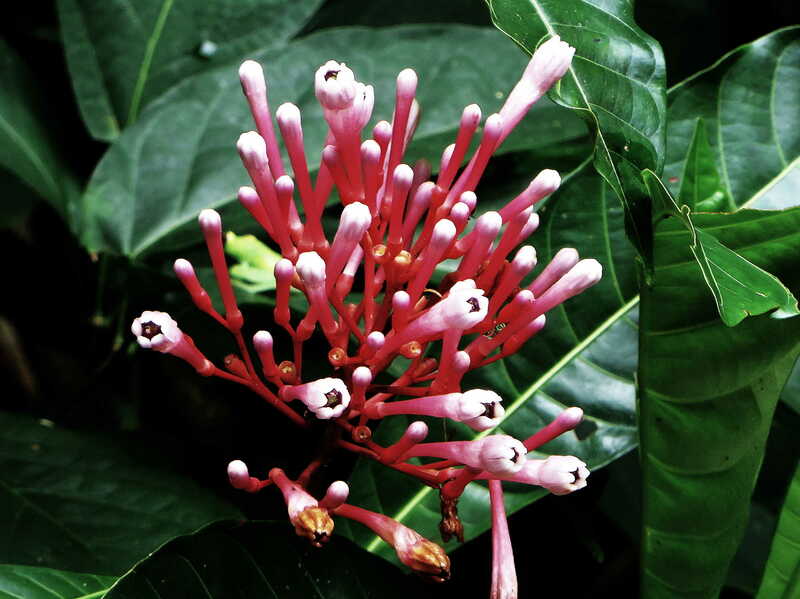 Heliconias are gorgeous plants with multicolored flowers that grow in the Amazon rainforest of Ecuador. They are becoming increasingly popular as ornamental flowers for the fascinating shapes of their flowers and beautiful colors. 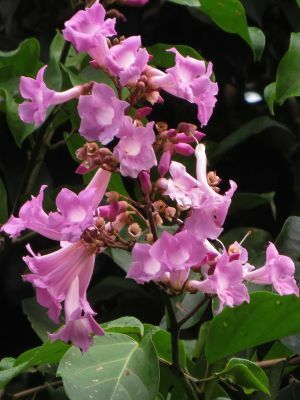 Some flowers have developed to be only accessible to certain species of hummingbirds. 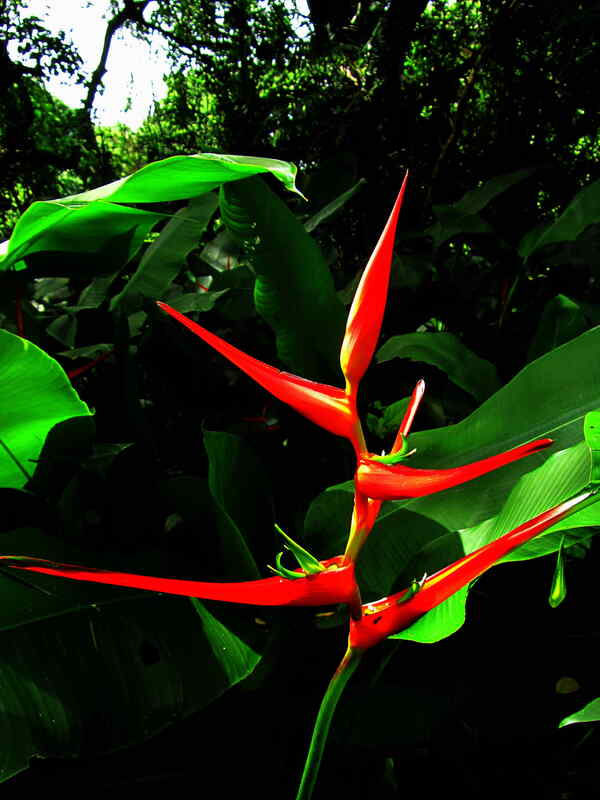 Heliconias are fascinating plants of the Ecuador Amazon rainforest with flowers in bright colors and incredible shapes. 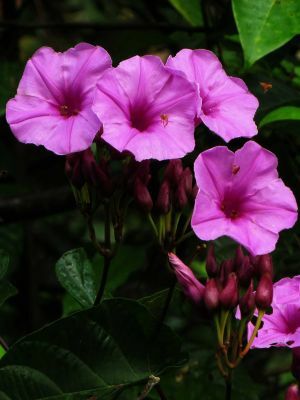 Just some tropical flowers that we photographed in the jungle. 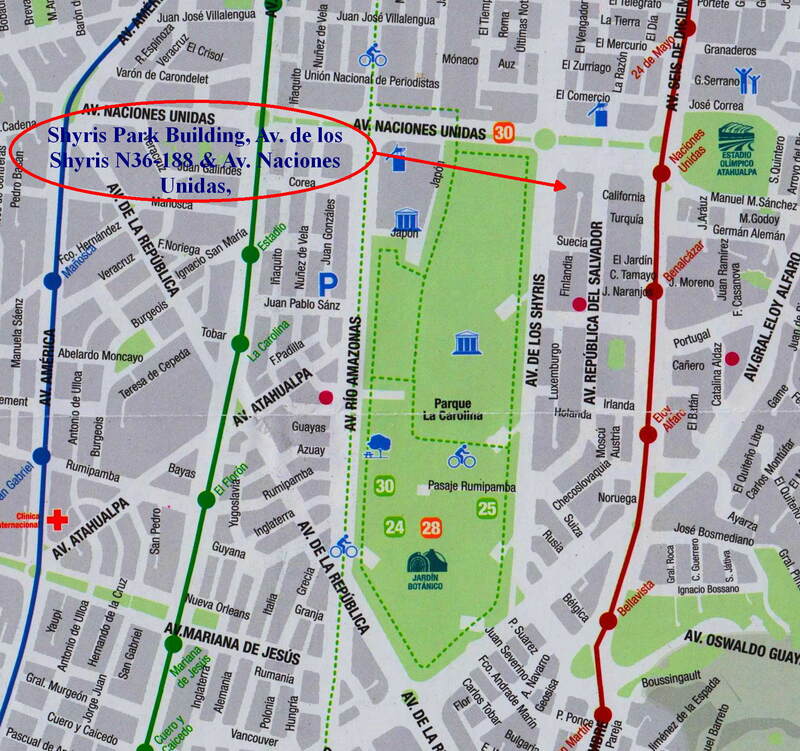 There are no native pine trees in South America. In fact, the most southern pine trees in the Americas are in Central America en Nicaragua. 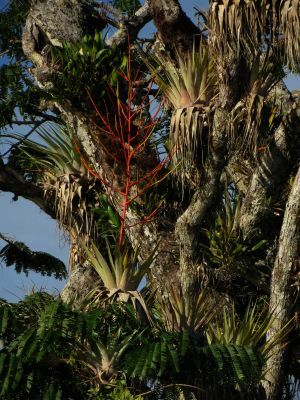 But there are some conifers in South America, most notably Podocarpus trees, in Ecuador, in Podocarpus National Park, and in Argentina you will find the Monkey Puzzle Tree, Araucaria araucana, but other than those, all South American conifers, like the common Pinus Radiata in the Andes of Ecuador, are introduced species from the North. 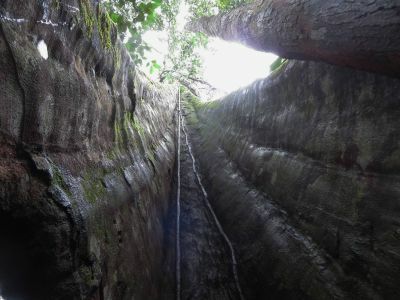 From the Andes foothills to the Atlantic Ocean, the elevation difference is only about 300m over a distance of about 3000km, in other words an average of 10cm per kilometer. Under such circumstances flooding is very common and there are many swamp forests. 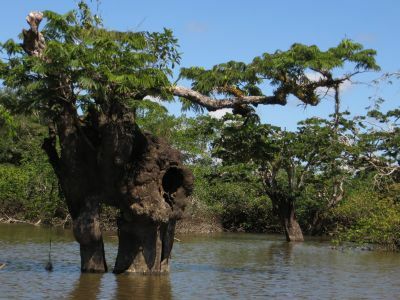 One of those swamp forests is the Macrolobium forest in the Cuyabeno Wildlife Reserve. 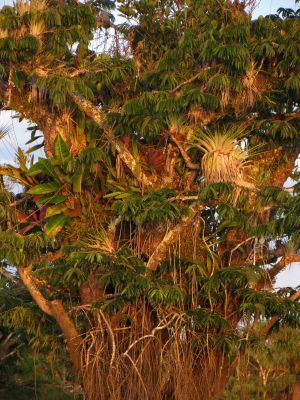 Macrolobium trees are covered with countless epiphytes, which in some cases may reach a layers of up to 1m thick. 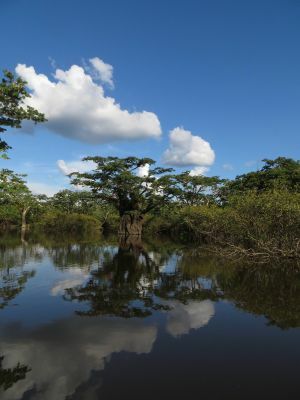 The Macrolobium groves are located in the shallow flooded zones of the Cuyabeno and other lakes, including at Lagarta Coche at the border with Peru. 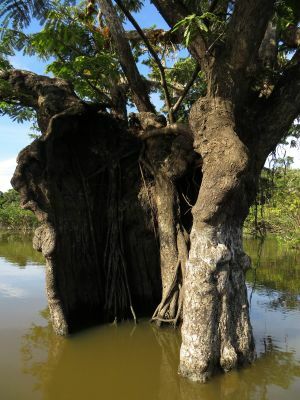 These bonsay shaped legume trees stand in water at depth where other trees can't survive; as mucho as 3m deep during high water levels. During the dry season, when they are flowering they may occasionally stand dry. Their leaves are the favorite browse for hoatzins, while the sometimes 1 meter thick carpet of epifytes for micro-ecosystems in their own right. 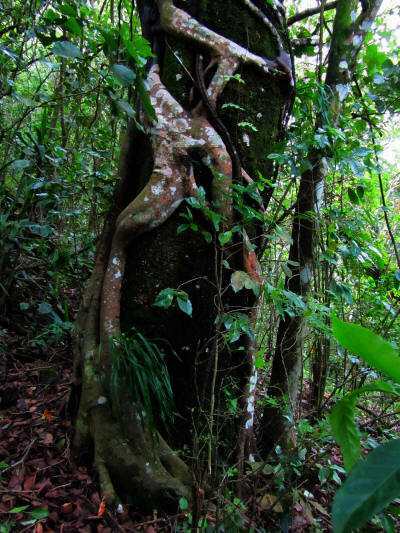 Some of the forest giants are so tall and heavy, that they need buttress roots to support them, while some of them actually grow in hollow shapes. 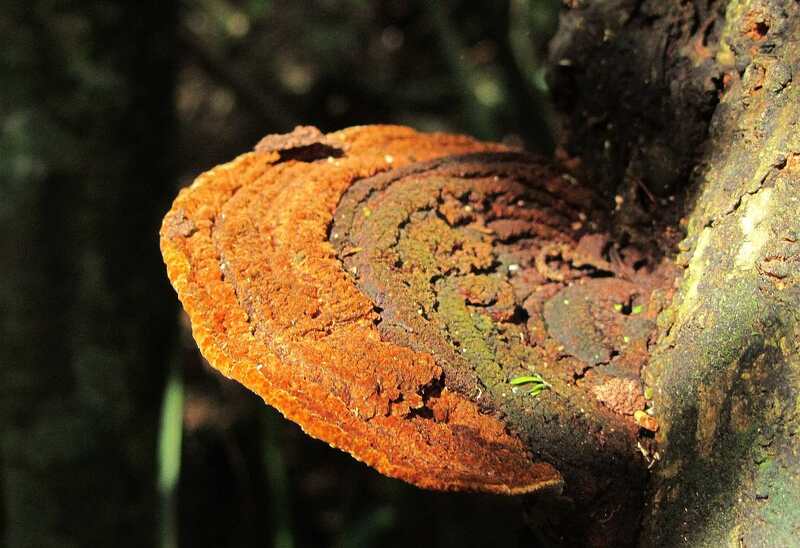 Much of their weight is due to thick covers of epiphytes, that can absorb large quantities of water that weigh down the trees. 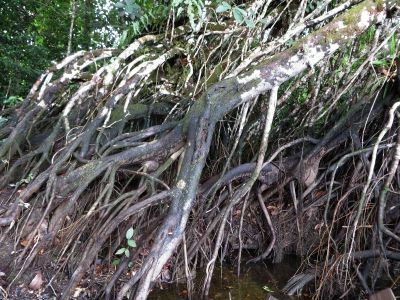 Other trees live along lake or river shores and have large numbers of roots growing down from their branches, thus resembling "fresh water mangroves". 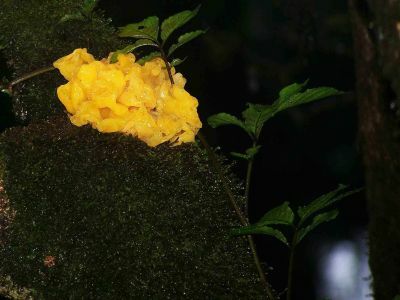 With all the humidity, mushrooms and fungi are an important decomposition force in the forest, as well as a predation or a symbiotic force. 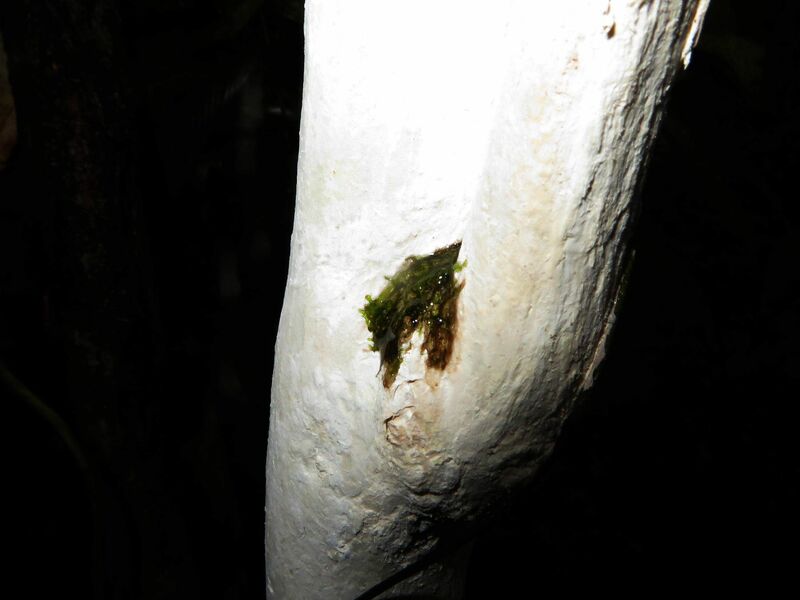 On the left a symbiotic fungus that covers the entire bark of a tree, and glows in the night. 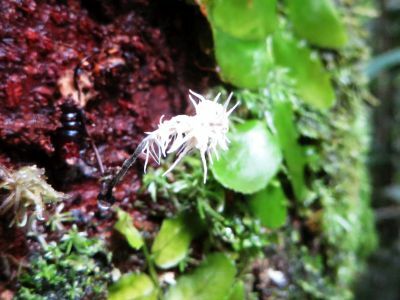 Another fungus grows in a live tree, while at the right a fungus growing from the body of an ant that it killed.